Big Blue Golden Gate was going to be a first in many ways. It was the first time this race had been held and it was the first time this group of people had raced together. The team for the day was Mari Chandler, Mike Prindiville, Craig Dalton and Mark Manning. Mike wanted to take a break from navigation so the maps were up to me. He would be providing horsepower on the bike and run along with Mari and Craig. For a race that started less than a mile from my house I still had to get up at some awful hour in the morning to get everything ready before the map pickup at 06:30. We drove to the start and managed to get rock star parking as few other people had arrived yet. It was still dark and teams were setting up their gear with headlamps on. 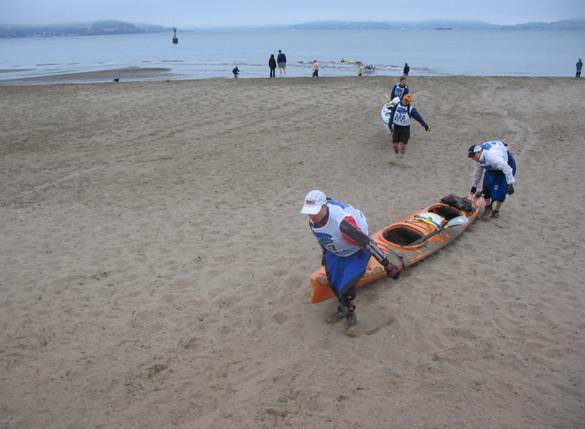 The whole team arrived around 6AM and we staged the boats on the beach in a long line facing the water. There looked like a small armada of kayaks, of all shapes and sizes, from the super fast triples to plastic sit-on-tops. There must have been at least 50 boats. We had the pre race briefing where Todd Jackson told everyone very clearly that they should read all the instructions for a section before they start it. This would save valuable time later. As it turns out some of the teams must have missed that part of the discussion. 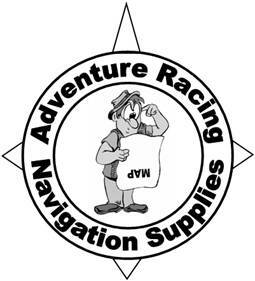 The organizers had arranged the navigation in a Mission Impossible style with different clues or instructions for nearly every checkpoint. We were handed the first set of mission instructions and it included a picture of a boat that we would have to find somewhere in the Bay and the route we would have to take in the kayak. Rumors went around at the start that the boat had been seen somewhere near Fisherman’s Warf so we would head that way after doing the loop around Alcatraz. Mike and I had a quick discussion and decided that we would start off by going around the North of Alcatraz and if that didn’t look like the fast route we would cut to the South of the island and around the buoy depending on how the current was taking us. The South side of the island proved to be faster once the current took us that way. All the teams lined up by their boats ready for the run into the surf. We were next to a team that had sit-on-top boats and were wearing wet suits. When we were given the start signal everyone picked up their boats and ran to the surf. Craig and I were one of the first boats to the water. We jumped in and started paddling like crazy. Mike and Mari were just behind us, as they pulled along side in their faster fiberglass boat we clipped on the tow line and headed towards Alcatraz. We were probably 4th or 5th boat as we reached the halfway point to Alcatraz when suddenly behind us there were horns blasting and loud sirens going off. I looked back as saw a massive freighter that had come from under the Golden Gate Bridge heading straight for the center of the pack of kayaks. We were well out of danger but it looked like a bunch of teams were caught directly in the boats path. I couldn’t imagine anything scarier than having a massive freighter bearing down on you while paddling a small plastic kayak across the Bay. Things seemed to calm down as we got closer to Alcatraz. The boat had passed but then we were hit by the wave that the freighter created. All of a sudden water was coming over the front of the boat and filling Craig’s cockpit. It was getting a little rough so we decided to unhook the tow line as the boats were going in opposite directions in the waves. As we reached the large green buoy on the East side of Alcatraz we were joined by a bunch of other boats including the Dirty Avocados. As we came around the buoy we could see a large grey boat in Fisherman’s Warf with the lead kayaks heading straight for it. We lined ourselves up and headed to find CP 3 which was a flag hanging from the anchor cable. The Dirty Avocados had passed us heading around the buoy but we overtook one of their boats again on the way to CP 3. Having got CP 3 it was a sprint back to the beach and the transition to the bike. On the way back we passed Aquatic Park which is a favorite spot for the local triathletes to swim. Normally they stay behind the breakwater but there was one brave guy swimming without a wetsuit outside the wall. He was going at a good pace and I called back to Donato on the Dirty Avocados team and told him that he needed to paddle harder because the swimmer was beating him. Donato hurled some insult back and I was still laughing as he proceeded to paddle past us to the beach and the TA. 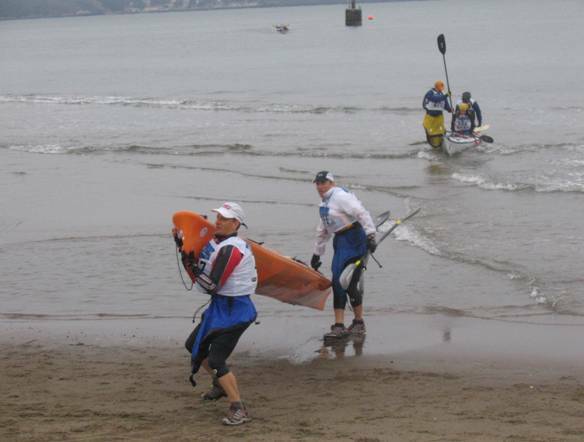 We came out of the water in about 5th place and dragged the boat up the beach. I tried to lift it but it was still full of water from the wave that came over us and I had to drop it again. I told Craig to just drag the bloody thing into the TA as it was way too heavy to carry. Once the boat was safely dumped in the TA we changed for the bike section and picked up the next set of instructions. The instruction sheet included a selection of photographs and some heading and distance values for various locations in the Marin Headlands. The instructions also included information on a mandatory 25 minute “transit time” to get to the next CP that was located at the North end of the Golden Gate Bridge. 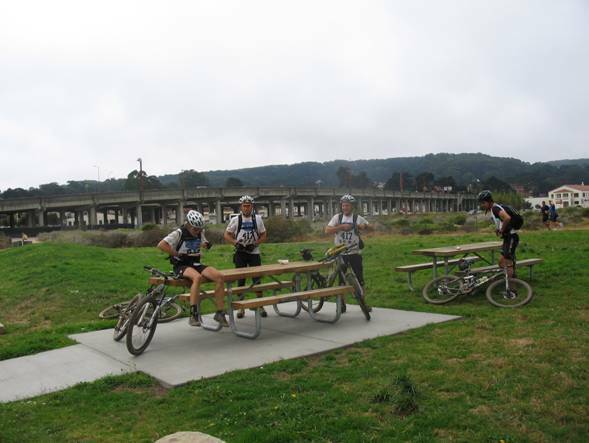 We jumped on our bikes and headed over the bridge along with a couple of other local teams. We decided to stop at the wide open area on the North end of the bridge as we still had some time in hand. This allowed us to carefully read the instructions and plot all the points for the bike section. The Basic Roamer AR made short work of the plotting as it was designed to do. The next 3 CP’s were out near the lighthouse so we decided to take the flat route via the tunnel. It looked like some of the other teams had taken the slightly shorter route with about 700 feet of elevation gain and loss by going up the Conzelman climb. That was the hard way to the CP’s. As we came down into the stable area we could hear cheering and whooping coming from Bruce, Hailey and Colleen who had made the trip out from the start to see us come through the CP. It was great to see them. We collected the signature from the manned CP and went on to the next part of the loop that took us up the next major climb and over to Muir Beach. CP 11 was located in the Zen Center and we found it hanging on the gate leading to Green Gulch trail. This is a steep single track trail that takes you back up to the ridge and the highest point in the park where CP 12 was located. We then had a nice descent down “big air” trail also known as Mewok (keeping the 15mph limit of course) and back to the stables to check in. The supporters were there again, but we caught them by surprise this time. There wasn’t so much noise. As we climbed back up the hill past the stables towards Rodeo Valley we came across a number of teams that were coming down the hill towards us. All I remember thinking was that this was going to be a long day for some people. When we reached the top we saw a 2 person team heading in the wrong direction on a trail that is illegal to bike on. It is also a really nasty climb. We called out to them and pointed them in the best direction down the single track. I hope this saved them from a long hard slog. We found out later that a couple of teams hadn’t read the instructions carefully enough. The instructions for CP 12 said something like “from CP 13 plot 270.5 deg TN for 1.08 miles”. Some teams waited until they reached CP 13 and decided to plot CP 12. When they did this they found that they had to go back up the 800 foot single track climb that they had just come down, because they had ridden right past CP 12 at the top of the mountain. This must have hurt! 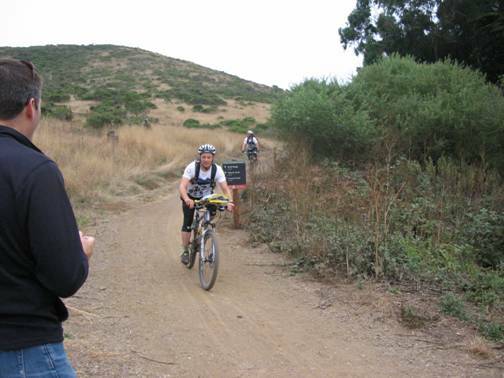 I’ve done that climb on Miwok trail once and swore I’d never do it again. Well that took care of our main competition. We hit the Golden Gate Bridge and now had 25 minutes to do the crossing back to the TA in Crissy Field. Mari decided to make a pit stop the Golden Gate Bridge visitor center. She apparently had to explain to the tourists that she was in a race as the line was out the door and she need to jump in quick. I’m sure people were a little intimidated having a mud covered biker storming into the rest room. We were out of there in no time. We arrive back at the TA and still had a few minutes in hand to set ourselves up for the next section. We sorted the maps, ate some food and put on our running shoes ready for the trek in the Presidio. While we were eating and getting prepared we even did a little interview with the San Francisco Chronicle as we were the first team through. When the time limit was up we checked in and dropped the bikes ready for the trek. We found the instruction on the board and they said that we needed to go to 610 Mason Street for the next set of instructions. Now 610 Mason Street may be the official address of the Sports Basement but the street on the map is called Old Mason Street. There is also a Mason Street in downtown San Francisco and we thought about heading there before I noticed a sign on the street that said Mason Street. Confusing I know and we later found out that a couple of teams actually went to the downtown Mason Street before they realized there was nothing there that related to the race. When we reached the Sports Basement we found Todd Jackson there with our next set of instructions. 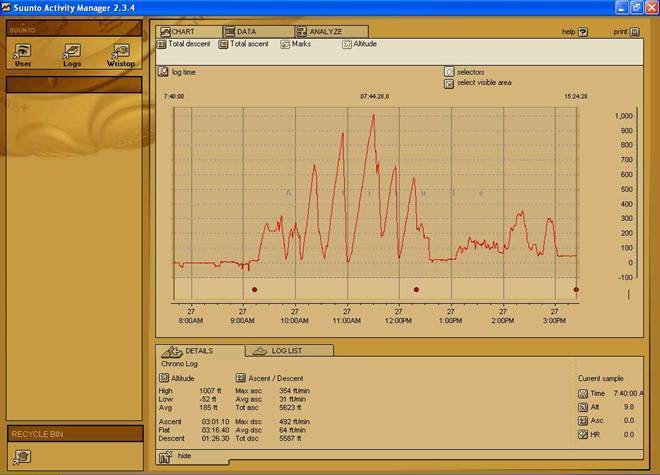 This was another plotting exercise that suited the Basic Roamer AR perfectly. We were done plotting the 4 points in less than 3 minutes with Todd looking on. We could get these points in any order and this is where things started to go wrong for us. 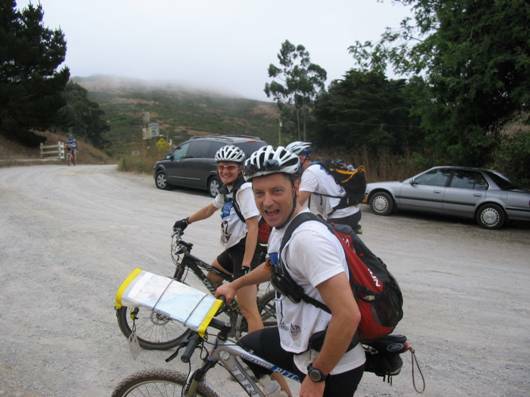 We later found out that we had a 34 minute lead on the second place team heading out to the trek but we didn’t know that at the time. We hit CP 20 almost spot on and counted the number of cannon balls on the parade ground. Next was CP 19. On the map it looked to be located in the middle of a park area. We went straight there and found the small park with a well in the center, but there was no CP flag. We stopped and plotted the CP again but the second plot put us in exactly the same place. I then tried plotting from grid north rather than true north just in case there had been an error in the course setters plotting. This put us on the next street over. We went there but still found no CP. We spent the next 45 minutes looking down every trail and other street around, while checking our plotting again, but it all pointed back to the small park area. At this point we were desperate and Mike decided to lift the lid on one of animal proof trash cans that was at the side of the park and there was the CP flag. Some local moron had taken it down from the tree and thrown it away. We had lost so much time with this one CP that I was sure we’d lost the lead, but no other teams had come through. We placed the CP back where we thought it should be and continued on. We sprinted through the rest of the CP’s and it was a crazy blur of bushes and trees. I was firmly attached to Mari’s tow line even when she jumped straight off a 4 foot cliff. Lucky it’s a long piece of bungee. The pace from the last CP back to the finish was really painful. I had the bungee on full stretch as Mari towed me along. We could see the finish from a long way out, that yellow Salomon tent looked so good. We came across the line to our friends jumping up and down. We’d finished the race but it wasn’t over yet. The team that crossed the line in front of us had done the trek loop in the opposite direction to us, which meant that they came across CP 19 after we had removed it from the trash can and placed it back in the circle. They lost no time because of it being thrown away. There was a short and very amicable discussion between Todd Jackson, Team Luna and us which resulted in a small time bonus for replacing the flag. If we hadn’t had taken the CP flag out of the trash, the other teams would have either had to skip the CP or spend additional time searching for it. I’d like to say a big thank you to team Luna for working with us in the end. 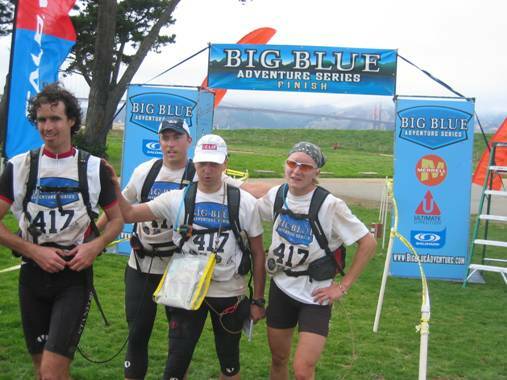 This small bonus gave us back the lead and the overall win for the Big Blue Golden Gate adventure race. The team did a fantastic job and worked together really well to finish the event in a fast time. The gear and support they provided us was the key to our success during this event.